So is there a definition of a red wine? Not really. The winemaker can call the red wine anything. It can be a special name like Magnificat, Joseph Phelps Insignia, Verite La Joie, etc. The TTB does have requirements for when the winemaker calls the wine Cabernet Sauvignon or Syrah. Here is a brief outline. o Grape Variety (the fruit). Must be 75% of that fruit. Can be blended with other grapes, up to 24.9%. Year in which the grapes were harvested. 2010 harvest is a 2010 vintage. 95% of the fruit must come from that year. o Reserve, this one is interesting as there is no legal definition for this term and it can be anything the winemaker wants it to be. 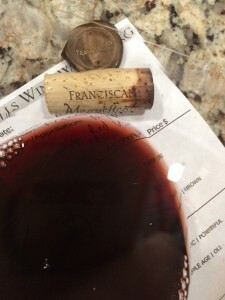 For some, it is the best of the best fruit of that vintage, but be cautious as some may simply be trying to sell their wine at a premium price. 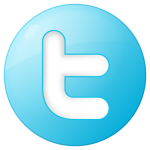 If you want to learn more about US wine Label laws I have detailed them in a blog. Reading US Wine Labels. Medium color depth, garnet hue. Aromatic, slightly earthy with aromas of plum, cherry, and cocoa. Dry, full-bodied with balanced acidity. Rich, savory palate, soft tannins with a long finish. 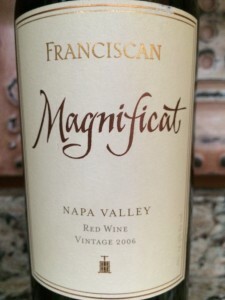 I rated the 2006 Franciscan Estate Magnificat four glasses.